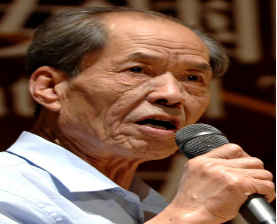 Chinese writer Chen Zhongshi died of cancer on Friday in Xi’an, Shaanxi Province. He was 73 and his masterpieces(杰作) included White Deer Plain, which won him China’s top literature prize. Chen was born in August 1942 in Xi’an. He started writing novels in 1965 and completed White Deer Plain in 1992, for which he won the Mao Dun Literature Prize in 1997. With the novel’s publication in 1993, Chen became very famous in China. The novel, based on the Chen’s hometown White Deer Plain in Shaanxi, tells of historical changes to the land over 50 years from the end of the Qing Dynasty (1644-1911). It has been translated into French, Japanese, Korean, Mongolian and Vietnamese. In 2010, the novel was adapted into a film of the same name and the film competed for the Golden Bear at the 62nd Berlin International Film Festival. Chen Xiaoming, professor of Chinese language and literature at Peking University, describes White Deer Plain as “simple, solid and vigorous”, regarding it as “a masterpiece that closely combines Chinese cultural tradition and the features of regional culture in northeastern China”. Chang Zhenjia, 72, an editor at People’s Literature Publishing House for more than 30 years. “It contains so much information in so long a time as half a century, and it’s very thoughtful, having many breakthroughs(突破),” Chang said. 1. Chen Zhongshi died because he got a ________. 2. Chen zhongshi started to write novels at the age of ________. 3. Maybe you can see the book White Deer Plain in _______. 4. The underlined word “vigorous” means _______ in Chinese. 5. Where may you see the passage? A In a TV guide. B In a travel magazine. C In a story book.